Exif is a tag structure for images and sound files. The tags contain information on the Camera’s model and firmware, the date and time taken, GPS location, Pixel height and width, exposure time, focal length, white balance, and all kinds of other information which is normally hidden by Apple’s iOS software. 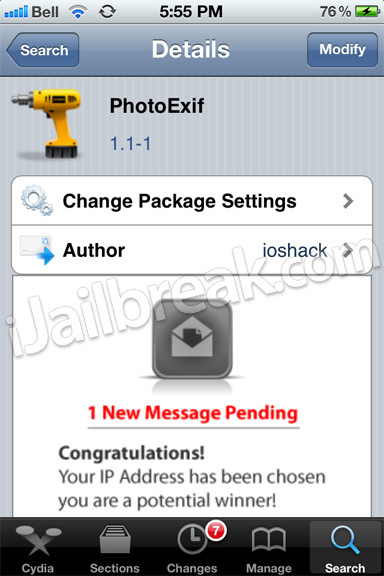 PhotoExif is a tweak that allows these settings to be viewed and edited on the iPhone and iPod Touch. When you install PhotoExif, it doesn’t create a settings page or a new icon. 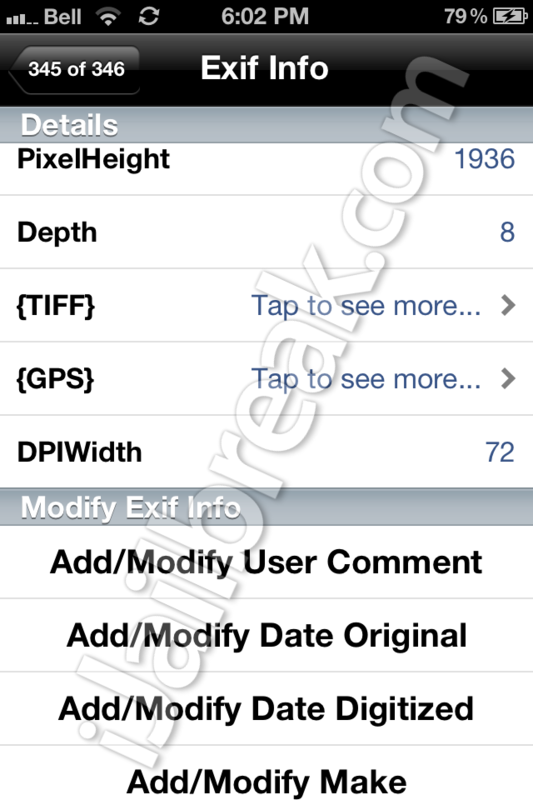 Instead, when you view a picture in Photos or Camera, you can access the Exif Info from the options menu. The information that will appear depends on the file in question. In addition to the information, there are options to Add/Modify a user comment, the original’s date, the date digitized, the make, model and software of the “camera,” and description. Also listed are options to modify image orientation and location, but these are not currently functional. A note from the developer promises to add these soon. After the changes are made, there is the option to save the picture as a new image. If you enjoy PhotoExif, there is also a button to buy the developer a drink. You can donate between $1-10 through PayPal. I did attempt to use PhotoExif on my iPad, to limited success. Some information does appear, but it’s in a pop-up dialog and not in an organized menu. Although the iPhone is more useful for photography, the iPad would be easier to made edits with. If you’re curious as to what photography settings your iPhone really uses, or if you want to edit the Exif data from your phone, you can grab PhotoExif from the BigBoss repository. The app is completely free. Do you edit Exif data? Share your thoughts in the comments section below.